The TWiV team is together in New York City for a conversation with Nobel Laureate Harold Varmus about his remarkable career in science. From ASV 2016 at Virginia Tech, Vincent, Rich and Kathy speak with Stephen Russell about his career and his work on oncolytic virotherapy – using viruses to treat cancers. The TWiVniks consider the role of a cell enzyme in removing a protein linked to the 5′-end of the picornavirus genome, and the connection between malaria, Epstein-Barr virus, and endemic Burkitt’s lymphoma. Vincent speaks with Blossom about her laboratory’s research on Kaposi’s sarcoma-associated herpesvirus, including how it transforms cells, the switch between lytic and latent replication, and its interaction with the innate immune system of the host. Tre TWiV amici present three snippets and a side of sashimi: how herpesvirus inhibits host cell gene expression by disrupting transcription termination. Vincent speaks with John Coffin about his career studying retroviruses, including working with Howard Temin, endogenous retroviruses, XMRV, chronic fatigue syndrome and prostate cancer, HIV/AIDS, and his interest in growing cranberries. Vincent meets up with Janet Butel and Rick Lloyd at Baylor College of Medicine to talk about their work on polyomaviruses and virus induced stress. 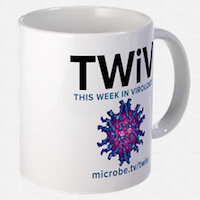 The TWiVites read listener questions and comments about public engagement in science, vaccines, RNAi, reprogramming CD8 cells to treat cancer, rabies, and much more. Vincent, Alan, and Welkin discuss how endogenous retroviruses in mice are held in check by the immune response.